WASHINGTON, D.C. -- U.S. 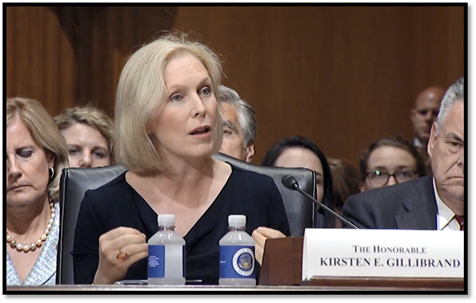 Senator Kirsten Gillibrand today testified in front of the Senate Finance Committee’s Subcommittee on Social Security, Pensions, and Family Policy and urged her colleagues to reject the Republican paid leave plan, which would weaken Social Security and hurt women and low-income workers, and instead pass the Family and Medical Insurance Leave (FAMILY) Act, her legislation to create a universal, gender-neutral paid family and medical leave program. The United States is the only industrialized country that doesn’t guarantee its workers some form of paid leave. Recent studies have shown that families lose around $20 billion a year due to a lack of paid family and medical leave. Gillibrand’s FAMILY Act would save workers much-needed income and retirement benefits. "Thank you, Mr. Chairman, and thank you, Ranking Member Brown, for holding this hearing. I really appreciate your leadership. I want to recognize my colleague, Senator Ernst, for her leadership and her interest in this bill and this debate that we’re having right now about how to produce a real paid leave plan. Here’s the truth: At some point, every person here – every person you know – is going to have a situation where you have to take some time off from your work to meet and care for a family member. It might be a medical emergency. Maybe your spouse is diagnosed with cancer, or maybe you suddenly need to take care of an aging parent or someone who has been diagnosed with Alzheimer's. Or maybe you’re starting a new family or just had a baby, like your constituent Jessica. Whatever the case is, no working American should ever have to choose between their family members and a paycheck. But if you don’t have paid leave, that’s exactly the choice that you have to make. And this is especially true if you are working a low-wage job. That’s unfortunately what millions of Americans have to deal with every time there’s a family emergency. Right now, 85% of workers don’t have access to paid family and medical leave. And lower-income workers are even less likely to have it. We are the only industrialized country in the world that doesn’t guarantee some form of paid leave. Recent reports have shown that this costs families $20 billion a year. And it also creates what we call the sticky floor, where too many women get stuck in low-wage jobs with no chance of advancement, because every time there’s a family emergency and they feel they need to ramp off, they can only ramp back on with a lower-wage job, lower down the rung, and they never get off the sticky floor. So Congress desperately needs to catch up. We need a national paid leave program now. The good news is that both sides of the aisle recognize that this is a national problem. Individual states are taking the lead, all over the country, with bipartisan bills and state laws that are offering real paid leave programs. And I’m very grateful to my Republican colleagues who are committed to supporting a national paid leave program that’s based on, perhaps, a Social Security model. But I urge them to support a comprehensive and fiscally responsible idea called the FAMILY Act. First, the FAMILY Act is an earned benefit, meaning it travels with you, whether you’re working full time, part time, big company, small companies – wherever you live, wherever you work. Second, the FAMILY Act, the way we’ve written it, it’s really affordable. It is about the cost of a cup of coffee a week, for you and for your employer. It's about $2 a week, on average, for all employees. That is not a great deal of money to know that if your mother is dying, that you can be by her side – or you have a new infant, or a special needs child – that you can be there when they are needed. It also gives you about 66 percent of your wages, guaranteed for up to three months, with a cap. So it’s affordable, it’s comprehensive, it’s an amount of time that can make a huge difference if you have an illness in your family or a new baby. Third, the FAMILY Act covers all workers, which I think is really important for all of these debates that we have. It’s not just about women, it’s not just about new babies. All of us have family emergencies. Any one of us here in the Senate, if our spouses were critically ill, we would want to be by their sides. But we have that flexibility. That is not true for most working people in this country. So we want to make sure it covers all family members for all reasons. The FAMILY Act covers birth or adoption, taking care of an older family member, addressing one’s own personal medical needs. And we know here in the Senate, we have been able to address our own personal needs because we have that flexibility. Let’s make sure every worker in America has that. Fourth, the FAMILY Act will level the playing field for small businesses. I’ve heard this over and over again, even when I went with Senator Heitkamp to North Dakota. The people who testified on behalf of having this kind of plan were the small businesses who said, you know, “We could never compete with big businesses. We could never be paying two payrolls at the same time. We could never offer this.” So, any incentive that’s just a tax credit or a tax cut doesn’t help that small business owner, because they’re never going to have enough money to do it. Also, small states – if you’re a small state like North Dakota, your state’s never going to have enough money to have a paid leave plan the way that California has one. The way that New York has one. And so this type of idea, because it’s comprehensive, covers all states, small states, big states, small businesses, big businesses. A small business today can’t compete with a Facebook or a Google or the Ernst & Youngs or the big law firms and all the places that can offer paid leave. So that’s why the small business groups have endorsed this bill. It has also been endorsed by a lot of larger businesses that already provide leave because they know how good it is for their business. They know that paid leave is actually good for profit, it’s good for employee retention, it’s good for productivity, it’s good for morale. Finally, the FAMILY Act does not create a false choice between having to take money early from your Social Security account. It keeps your Social Security account secure so your retirement benefits are there for you. That’s why I think this is the kind of paid leave plan that we could all get behind, because it makes sense, it doesn’t cost a lot of money, and it covers everybody. It’s portable, it works with the gig economy, it works for part-time workers. It literally works with everybody, because it is an earned benefit just like Social Security. So I hope this is something that people can endorse. It’s already been endorsed by a coalition of Fortune 500 companies and small businesses because it is good for business. And what’s good for business, is good for this country, it’s good for our economy, and we know it’s good for families. So I urge all of you to support the FAMILY Act. Thank you."